Since its inception, the Orion Quartet has been consistently praised for the extraordinary musical integrity it brings to performances, offering diverse programs that juxtapose classic works of the standard quartet literature with masterworks by twentieth and twenty-first century composers. The Quartet remains on the cutting edge of programming with wide-ranging commissions from composers Chick Corea, Brett Dean, David Del Tredici, Alexander Goehr, Thierry Lancino, John Harbison, Leon Kirchner, Marc Neikrug, Lowell Liebermann, Peter Lieberson and Wynton Marsalis, and enjoys a creative partnership with the Bill T. Jones/Arnie Zane Dance Company. The members of the Orion String Quartet—violinists Daniel Phillips and Todd Phillips (brothers who share the first violin chair equally), violist Steven Tenenbom and cellist Timothy Eddy—have worked closely with such legendary figures as Pablo Casals, Sir András Schiff, Rudolf Serkin, Isaac Stern, Pinchas Zukerman, Peter Serkin, members of TASHI and the Beaux Arts Trio, as well as the Budapest, Végh, Galimir and Guarneri String Quartets. The Orions serve as Artist Members of the Chamber Music Society of Lincoln Center and Quartet-in-Residence at New York's Mannes School of Music, where they are featured in a four-concert series each year. The 2016-17 season also brings the Orion Quartet's return to the Chamber Music Society of Lincoln Center for programs of Haydn and Bach, and of Puccini, Hugo Wolf and Giovanni Rota, which CMS LC also presents at Hugh Hodgson Concert Hall in Athens, Georgia. Soprano Tony Arnold joins the Orion at Washington, DC's Library of Congress for Schoenberg's String Quartet No. 2 and Brett Dean's Quartet No. 2 "And once I played Ophelia." New School Concerts presents the Orion twice, first in collaboration with the Dover Quartet in Mendelssohn's Octet and Mozart's Viola Quintet K. 516, and then in Haydn's The Seven Last Words of Christ. 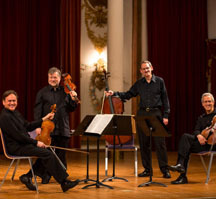 The Quartet is also being presented by the Philadelphia Chamber Music Society at Benjamin Franklin Hall, and by the Chamber Music Society of Westchester. The Orion concludes the season with their annual return to the Santa Fe Chamber Music Festival, where they have become distinguished for commissions of unusual works by major composers. The ensemble celebrated its 25th anniversary in the 2012-2013 season with a collaboration involving the Bill T. Jones/Arnie Zane Dance Company at New York City's Joyce Theater, for a special two-week project which featured music by Mozart, Mendelssohn, Ravel and Schubert, plus a specially commissioned Beethoven arrangement. WQXR's The Greene Space presented a live-broadcast of the collaboration, including a performance and a conversation with the Quartet and Bill T. Jones. Heard often on National Public Radio's Performance Today, the Orion has also appeared on PBS's Live from Lincoln Center, A&E's Breakfast with the Arts, and three times on ABC-TV's Good Morning America. Additionally, the Quartet was photographed with Drew Barrymore by Annie Leibovitz for the April 2005 issue of Vogue. Formed in 1987, the Quartet chose its name from the Orion constellation as a metaphor for the unique personality each musician brings to the group in its collective pursuit of the highest musical ideals.